Since the earliest days of cinema, moving picture shows have provided a refuge from the reality of ordinary life. There’s something undeniably special about sitting back and seeing the room fall into darkness as voices lower to a whisper and the credits begin to roll. The mystery behind the movie magic will always be a part of its charm. But the rules for replicating this experience yourself don’t have to be such a secret. Today, armed with the latest technology and a little DIY ingenuity, you can bring Hollywood to life for much less than you might have imagined. STARTING NEW OR STARTING OVER? If you can start new from scratch and include blueprints for a theater in the initial construction, you’re already one step ahead. Collaborate with your building contractor and create a custom-purpose room that fits seamlessly with the style, character, and function of the rest of your property. When building your theater from the bottom up, you can plan ahead to include the wiring you’ll need for lighting, audio, and video before the walls are even built. And if you’d like to mount a retractable projector, install professional-quality cinema seats, or add extra sound-absorbing insulation. These features can be better accommodated early on, as well. Most experts would agree that the basement is the best area of the home in which to replicate the traditional theater experience. This is because, for optimal sound and video, a dedicated media room should be as isolated as possible—think thick concrete walls, few doors and windows, and just enough room to seat everyone comfortably. Your space should be constructed with acoustics in mind and to the ideal dimensions for viewing. Starting over with a retrofit of an existing garage, attic, or side room, however, will require a bit more creativity. You might think that the technological equipment you buy and furniture you put in the space will define your theater experience. This, however, is not the case. Making an effort to optimize your room’s existing physical acoustical characteristics will go the furthest toward creating a truly immersive environment, and it begins with understanding the shape of your room and the dimensions you’re working with. Bigger rooms mean deeper base, and that’s never a bad thing. But smaller spaces make it easier to create an intimate, sealed-in soundscape. To begin, look carefully at the room you’ve chosen to remake into a theater. When creating the perfect home system, you’ll want to plan out ahead of time how to maximize every inch you have to work with. The placement of windows, walls, and other furnishings will significantly impact the acoustics and operation of every component you choose to install. Draw up plans to help avoid any construction challenges before you begin tearing down (and into) your walls. Confirm that your room has the space to accommodate a 100- to 120-inch screen, and the throw distance to match your projector to that screen. And, of course, you’ll want to make sure that the space can become completely dark when it’s time for the movie to begin. Last but not least, it’s wise to “future proof” your system and design it in such a way that makes it easy to upgrade components down the road. By introducing two-inch cable conduit into the pre-wire planning phase, you can help future cables, like fiber optic, fit through finished ceilings and walls without effort. Selecting the right electronic equipment will elevate your movie-watching experience and help you replicate all the timeless romance, drama, and mayhem of the silver screen. You don’t need to spend a fortune outfitting your room with the latest and greatest components; you just need to spend wisely. And don’t forget your tape measure—whatever equipment you buy, you’ll need it to fit through the door! Start from the sound up. Make sure to budget for all acoustical components you’ll need to ensure a three-dimensional audio experience. You don’t have to be an audiophile to appreciate the value of a strong sound system. When it comes down to it, the most important aspect of a film is the dialogue. Every cent spent on a surround sound speaker system will be well worth it! Depending on how you’ve chosen to design your theater room, you may have room to add more speakers and possibly more than one subwoofer. But for a “traditional” Dolby Digital 5.1 system, you’ll need five speakers (front and center channel speakers, plus left and right surround speakers) and one decent sub. The placement of the subwoofer and the speakers in your room will have a significant impact on sound quality and bass, so give yourself enough room to move everything around a bit. A longer cable (25 ft. / 7.62 meters or so) will help here, and for speaker wire, a 250-ft. (76.2 meters) roll of 16-gauge wire should do the trick. Ideally, your left and right front speakers should be placed at an identical angle away from the central seating point, equidistant from both the audience and the screen. Allow a clear path for the sound to travel; if you can’t see one or both of them, sound is being blocked. Place your surround speakers on both sides of the seating area just above ear height. The location of the subwoofer is the most flexible—just be sure to avoid placing it directly in a corner. Don’t be afraid to fine-tune its placement as you begin putting your theater system to use. There’s nothing like sitting in the glow of a crystal-clear movie image, and with little more than a pitch-dark room, a projector, and a screen, you’ll be able to achieve a fairly adequate visual presentation. But with today’s technology moving at breakneck speed, there’s no reason to not look for devices that deliver the best and brightest in modern movie viewing. Some of the newest models will even let you go 3D. A projector and a large screen will allow you to go big, but before you plunk down the cash for a new projector, be sure to calculate exactly what’s best for your room. It’s wise to go online and choose a model that offers a winning combination of picture quality, light output, and price. And while a great projector may come at a steep cost up front, it will give you and your audience the best possible box office experience. Now, when it comes to the projection screen, you essentially have two options: fixed and retractable. A fixed screen is the superior choice for several reasons. First, a fixed screen with a frame border (ideally covered in soft, black material) will help everyone’s eyes focus on the bright moving pictures and amp up the perceived contrast of the image. Your audio/video receiver might not be the hottest piece of equipment, but it’s the hub of your home theater—the brains of the operation. Your amplifier and receiver will tell your sound system what to do and how to sync up with what’s on screen. Today’s selection of home theater receivers offers all the fundamentals: 5.1 surround sound support, 3D compatibility, and more user-friendly functionality. Lighting is the last critical component. Control4’s smart lighting line will raise your home theater’s IQ by providing wireless dimmer, switch, and keypad functionality. Gone are the days of getting up to switch lights on and off after the movie has started. A connected light system will allow you to not only control the color and brightness of the bulbs, but also switch up the room’s ambiance right from your remote or the smartphone in your pocket. An expansive theater setup often leads to a tangled mess of wires, but this can be avoided with some simple cable clamps and ties, a cord organizer, and cable tunnel kit. Be sure to purchase a power protection device as well; in case of a sudden electrical spike or a power outage, you’ll want to be prepared. If you’re going to invest in quality audio/video equipment, it only makes sense that you’ll also want to customize the room’s flooring, seating, and decor for acoustical balance and ease of viewing. A perfect theater experience encompasses all five of the viewer’s senses: sight, sound, touch, taste, and even smell. From comfy theater seats to freshly popped popcorn, why shouldn’t you have it all? First, make sure your room’s flooring treatment will be an asset to your new sound system. Carpeted floors are best for absorbing big, powerful bass, as well as for helping to control and clarify higher frequencies. And in your dedicated theater room—as we’ve mentioned before—it’s critical to have total control over ambient light. Any glimpse of the sun risks washing out the image on screen. You have a wide range of options when it comes to sound and light proofing your space. Thick drapes work double duty by working as sound absorbers as well as sealing out sunshine. And for the ceiling, soundproofing acoustic deadening sound tiles are an inexpensive way to minimize as much outside noise as possible. Now you can consider different seating possibilities. Shipping pallets are a terrific and inexpensive option, but you’ll need space to set them up the right way. Once they’re in place, however, you can fit DVDs, books, and magazines into spaces on the side for additional storage. If you’ve got a bit more room in your budget, you can look beyond DIY seats and max out on lounge recliners, typically with cup holders, foot rests, massagers, and heat all built in. Bottom line is, while there are a few constraints in how you plan your seating style, don’t be afraid to follow stereotypical conventions. Bean bag chairs, even inflatable couches, are making a comeback. Just be sure that any type of unconventional seating you add won’t negatively impact the room’s acoustics or block anyone’s view! In a dedicated home theater space, you can go as wild as you like with the decor (Lava lamps? Shag rugs? A cheeky life-sized replica of the Gojira monster? ), but if your guests don’t share a passion for retro 60’s ambiance (or anything else your humble heart desires to hang on the wall), be sure to have another secret weapon at the ready: salty, sugary, irresistible movie snacks. Any truly epic home cinema will provide the audience with delicious concessions to accompany whatever’s screening that night, whether it be a film club viewing of Citizen Kane or the debut of a new Minions flick. For this, use a little imaginative effort to assemble a snack bar that can hold your preference of food and beverages. True connoisseurs should consider a margarita machine, a home soda fountain, or even a beer tap. Finally, you’re ready to sit down with a cold soda, your favorite film treat, and enjoy the show. 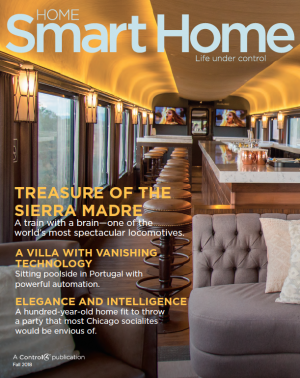 When your home theater system is “smart” enough to connect to a myriad of other products in your home (such as the shades, security system, and door locks), you can put your mind at ease and lose yourself in the moment at hand. A single tap on a Control4 touch screen can start or stop the movie in an instant, if needed, and connect you to other audio and video devices around the home. And wouldn’t it be even more convenient if you could experience the pleasure of your audio and video media in every room? With Control4’s multi-room video solutions, every member of your home audience is able to enjoy the same film you’re watching in any room of the house. Using one remote, you can distribute 10 HDMI sources (satellite/cable boxes, streaming media, media players, or gaming devices) to 10 video display locations in crisp, clear 4K HD. 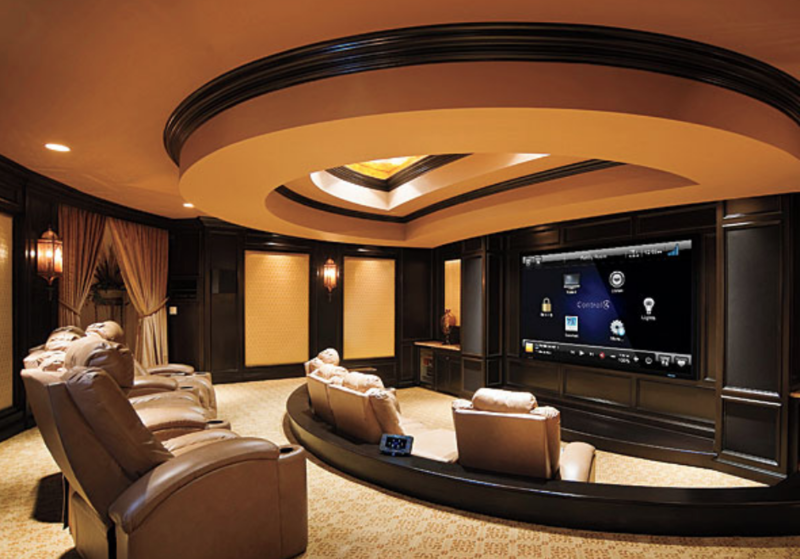 An unbeatable home theater is within reach, and the latest technology can provide for intelligent solutions for both new construction homes or retrofit installs. Armed with a little research and simple DIY skills, you too can create a killer home theater in less than the total run time of Gone with the Wind. Interested in a striking home theater of your own?